Leave the driving to us! 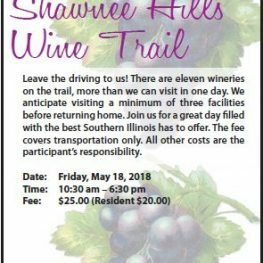 There are eleven wineries on the trail–more than we can visit in one day. We anticipate visiting a minimum of three facilities before returning home. Join us for a great day filled with the best Southern Illinois has to offer. Fee covers transportation only. All other costs are the participants’ responsibility.